The Sepasoft™ OEE Downtime Module offers many features to help you maximize manufacturing effectiveness. Tracking overall equipment effectiveness (OEE) and downtime just got easier. The Sepasoft™ OEE Downtime Module empowers manufacturers to reduce operating costs while increasing asset utilization and operating efficiency, resulting in improved profitability. Enhanced Production Scheduling allows you to visualize the production schedule including actual versus targeted production, machine status, delayed production, and more in real-time. Scheduled production entries can be obtained from a higher level enterprise resource planning (ERP) system, manually, or by simply dragging a work order onto the schedule. Breaks and other routine workday events are displayed on the same schedule by providing a complete intuitive view of current and upcoming production activities. Schedule entries are automatically adjusted to accommodate production progress, breaks, and other factors that affect production in real-time. Scheduled production is dispatched to equipment operators, warehouse staff, quality technicians, and more to keep everyone working with the up-to-the-minute production schedule. The OEE Downtime Module accurately tracks production counts and other key data when running multiple products on a line. Our module also supports running changeovers with two or more products running on a production line simultaneously, in addition to supporting many other production scenarios. Tracking a product’s progression through a line’s sub-equipment (cells) is effortless and can be triggered by the Equipment Operator or automatic signals sent from the equipment. The OEE Downtime Module handles Equipment Statuses in two parts–logistical and local. Consider that the local status (Equipment State) indicates if the equipment is running or down with a fault. Meanwhile, the logistical status (Equipment Mode) indicates what the equipment is purposed for at some time: changeover, production, or maintenance. By capturing the local and logistical status of equipment, we represent valuable context for production data. Both status levels can be configured with custom values for different equipment and organized in logical groupings so each piece of equipment has the correct asset utilization categories and downtime reasons. 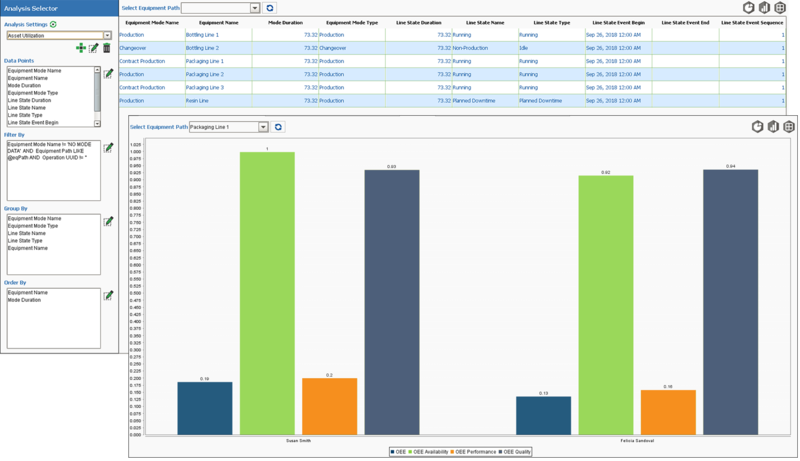 The analysis capabilities open up new insights into equipment statuses. Consider the case of an estop pressed on a machine. This is valuable information during production, but expected and not valuable during maintenance activity. By filtering out maintenance status, the valuable data comes to the forefront and can be utilized for continuous improvement. A variety of downtime detection algorithms accommodate different equipment layouts to provide the true cause of downtime events. Primary production equipment commonly contains multiple sub-equipment items (cells), and based on the selected downtime detection algorithm, the system will determine the root cause that the primary equipment is not in production. Simple equipment state, initial reason, parallel cells, the key reason, and more downtime detection algorithms can be used at the production line level or cell groups that support a wide variety of scenarios. The key reason algorithm supports the key cell being located anywhere within the line and considers backups or starved conditions to determine the root cause of the downtime event. When there are equipment layouts where the root cause is not appropriate, the OEE Downtime Module tracks cycle times that can be used to determine bottlenecks in product flow. Blocked or starved times are tracked separately to support narrowing in on actual equipment downtime events. Operators can visualize downtime events as they occur in real-time. With the most common configuration, the begin and end times of each event are automatically recorded, completely eliminating inaccurate timed data. Downtime events can be overridden or split to ensure that more accurate and actionable results are provided. In addition to the downtime event details, free-form text notes can be entered to increase the actionable data used for process improvement. Interactions between sub-equipment (cells or groups of cells) on a line can be viewed with the graphical timing chart to diagnose and optimize product flow. Equipment modes, states, counts, shifts, standard rates, user-defined addition factors, and more are always monitored and recorded on change events. This supports real-time production tracking but also supports adding additional data after the fact or correcting past recorded values. Built-in store and forward through Message Queuing Telemetry Transport (MQTT) fills in gaps in the recorded data in the event of network outages. The OEE Downtime Module has a built-in analysis engine that reads the recorded data and calculates different values including OEE, cycle times, and production counts. Impromptu Analysis enables the user to include data points for multiple date ranges allowing them to see results on the fly. Then they can group the data to narrow down inefficiencies. For example, they might start with downtime by shift, then add an operator to diagnose if additional operator training is needed. 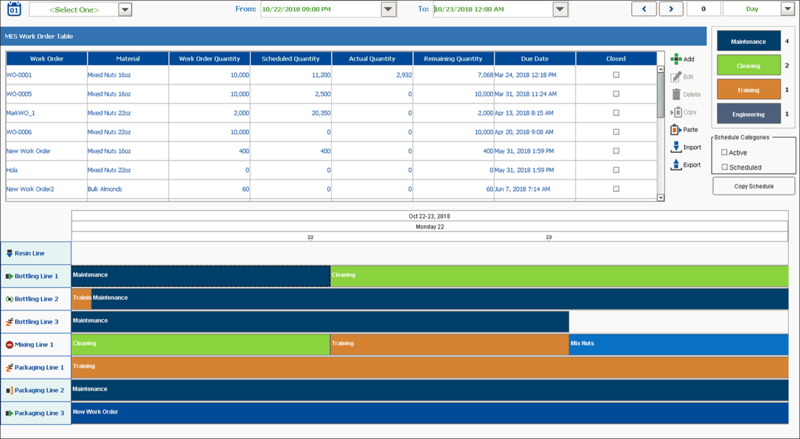 Use the result from impromptu analysis to create dashboards and add-on displays to make production information visible. Impromptu Analysis allows you to keep analyses private, share with a group, or make public depending on the analysis security settings. A couple of options for analysis settings security include permission settings for user roles that determine who can modify and/or execute the analysis settings. A user who can modify helps keep unwanted modifications from happening, whereas a user who can execute allows analysis results visible to anyone contributing to efficiency improvement. For common production metrics that reflect up-to-the-minute conditions, Live Analysis is used to automatically recalculate analysis as production events occur or can recalculate at a configurable interval, whichever comes first. Each line and its sub-equipment (cells) can have multiple Live Analyses active that can be based on the day, shift, run, or custom time period. The analysis engine uses a proprietary caching algorithm to return the results in real-time. The Material Manager component allows you to easily define production settings and control the production line, cell groups, cells, etc. Make unique adjustments for each material and equipment combination down to the sub-equipment (cell) level. This enables your company to correctly set OEE production rates, select cells, and other settings to help your production run smoothly. Unlimited OEE calculations per physical production site and Ignition server license. One active OEE calculation per machine license with unlimited downtime collection for child cells (sub-machines). The OEE 2.0 module is built in compliance with the ISA-95 standard, providing a consistent model and terminology for production control and tracking. The ISA-95 standard has been vetted by many manufacturers and applied to many processes and has been proven valuable over many years. ISA-95 compliant Sepasoft MES Modules include OEE Downtime, Track & Trace, and Recipe/Changeover. Sepasoft™ uses ISA-95 to provide seamless integration between lot tracking, production control, OEE, and downtime tracking solutions. ISA-95 compliance allows you to utilize an open standard (as opposed to a vendor’s proprietary system) providing you the ability to share data with an ERP or other business systems.